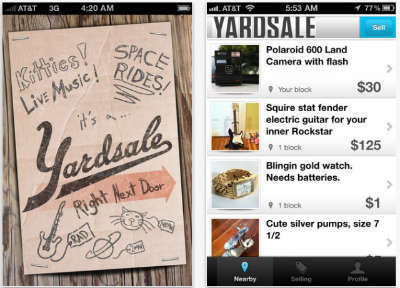 For those small businesses that deal in goods–and there are plenty of them out there–the Yardsale mobile app looks to add a whole new channel for moving product. Yardsale provides a new channel for those small businesses that are finding eBay too crowded and Craigslist unreliable, and attempts to boil down the experience of selling goods into a form that’s almost as easy to use as Instagram. 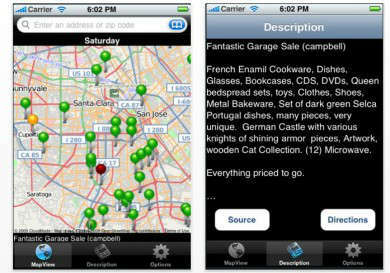 The Yardsale app depends heavily on a visual experience–it’s heavy on the pictures–to help people and businesses alike make sales. Yardsale not only allows for those unreliable Craigslist listings to feed back through its own–the more channels available, the better potential shot at sales–and also brings in a social component to its operations, allowing for both direct links to Twitter and Facebook. The app is free to those who sell and buy alike, making it an attractive pick to say the least, though that particular bonus won’t last forever. Reports suggest that a ten percent cut of sellers’ transactions is in the cards for future development. Yardsale’s primary focus is on the smaller sellers, where eBay used to focus before putting more power in the hands of the power sellers with massive inventories. Right now, the Yardsale app is only available on iPhone, though the Yardsale website will allow you to sign up for an email blast that will let you know promptly when the Yardsale app will make the move to the rest of the major platforms like Blackberry and, of course, Android. This in turn represents both the high point and the low point of Yardsale; while users will be able to get maximum exposure with the Yardsale app, the exact capability of selling via the Yardsale app is somewhat suspect. Still, however, it’s worth bearing in mind that this is exactly how eBay went. Getting in on the ground floor of Yardsale may be a whole new chance to get in on a sales channel that will one day rival eBay itself. Sales channels, however, aren’t the only means to make a small business successful. Cloud-based telephony tools like local numbers and call answering services can help keep customers in contact with your small business, while tools like Yardsale can help them find your available goods in the first place. So while Yardsale may only be of limited use and effectiveness right now, its potential is as yet untapped, and unknown. It could well prove the next eBay…or nowhere near. This entry was posted in iOS Apps, Marketing, Sales, Small Business by Steve. Bookmark the permalink.